I've joined up here as this appears to be the only forum in the world that covers the WR200's. Over the winter I picked up a tired DT200WR that I then proceeded to dump in the back of the garage as funds and temperature prevented me from doing anything. My longer term plan will be to do a complete strip and rebuild of the old 200 but for this year I'm going to fix a number of immediate issues and simply ride it whilst gathering the other parts to make it into a supermotard. The main issues I have are with the forks as I need to replace not only the seals (easy enough) but also one of the damper rod units inside, but as I have the fully adjustable ones I'm struggling to locate the required unit new or second hand. They look similar to those fitted to the YZ200WR, Belgarda TT600, YZ125 and YZ250 of similar vintages = ?? I'm also missing the original headlight and front mudguard which like any other WR body work is like the proverbial rocking horse poo. My plan is to get the headlight from a DT125X/RE or WR400 asI prefer this style and the X has a matching SM guard as well. The WR was never that popular in the UK and the DT200WR I have was only ever available as grey import so spares are now non-existent. The WR200 was very popular in France so I'm busy looking on Ebay.Fr and Leboncoin to fit bits but am struggling as the French don't like posting internationally. 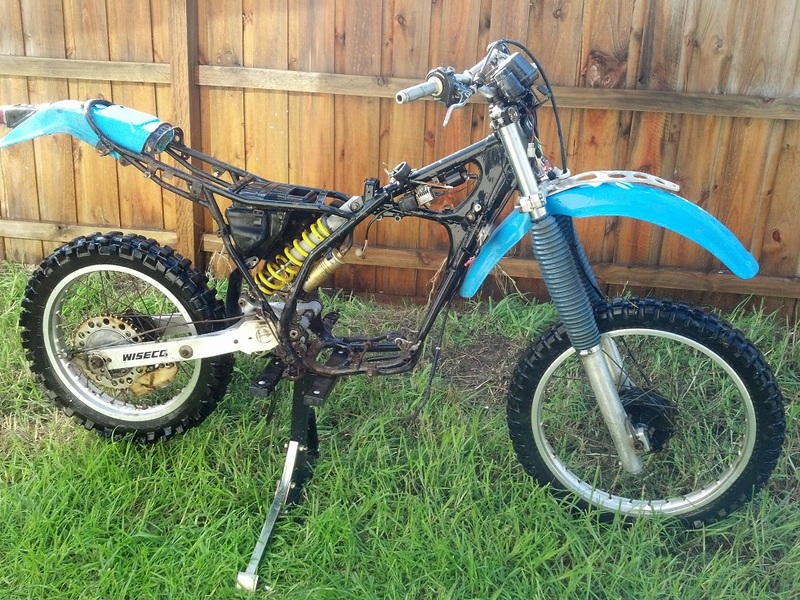 Hi Ben, welcome to the forum, I also am a newby, there are couple of wreckers on eBay Australia selling pairs of forks & they may be willing to ship em? . I found a white WRF 07-11 replica headlight on eBay for $35 AUD & installed a white latest version YZ450 front guard, makes it look modern without being ove the top. Check out the pics o my bike in recent topics. Cheers FixitAndy. Thanks - I'll check it out and consider it an option for mine. Thought I'd found some forks locally but the vendor turned out to be in the states so shipping would be extortionate! Worst thing is I only need the internal damper tube x1 so a complete set of forks is and overkill. If you find a set over here, perhaps have them shipped to a member and have just the damper rods sent over Much cheaper. Other thoughts - If you are going to make it a SM them would the whole front end from a WR125X work? What Yamaha part number exactly is that? I have spare forks without outer tubes and bottom nuts from a WR, but they are not regulated from top cap. Regarding the WR-X forks I won't be running those as they are shorter and lower quality than the adjustable usd ones I have. I'm probably going to get my hubs laced into a set of 17 inch rims but have yet to find a bigger disc that matches the hub so far. I've tried to upload pics but this website uploader doesn't find them on my phone = ?? Next mission is to clean the rust off the FMF expansion chamber and steel section of the tail pipe. Have given it one go with Harpic high power toilet cleaner which has removed some rust but it needs multiple attacks to get it ready for painting. I need to get rid of quite a few dents in the pipe as well but have no experience of how to go about this. Have heard tales of using water / freezing but no idea at moment.